Looking back at some newspapers over the past year, I couldn't help but smile as I stopped to look at this year's Hillsboro High School Prom King Dalton Tefteller, whose million dollar smile is one for the record books. You just can't keep yourself from smiling when Dalton looks up and smiles at you. It's purely contagious, and even award-winning. Yup, Dalton was the champion of the Illinois State Fair smile contest several years running. Angie took this photo of us with Dalton at his graduation party. But I got to know Dalton's smile long before he was famous. He was just two or three when I met he and his mom at Litchfield McDonald's. They were the representatives that year for the restaurant's Give a Little Love campaign, which raises money for the Ronald McDonald House. 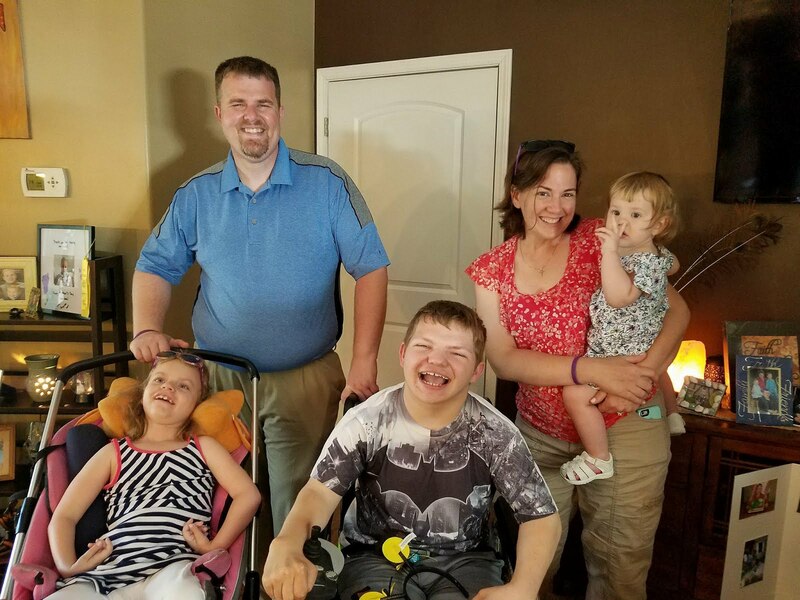 The Teftellers had stayed at a Ronald McDonald House, after Dalton got sick, just after his first birthday. His mom, Angie, told me that he went from being able to walk and crawl, to being unable to do so, and no one had any answers. At the time, the best they ever got was that he had some kind of a virus that could possibly have caused brain damage. When I did the story for McDonalds, I remember Angie telling me they were going to send the story to Ellen and other celebrities in hopes of raising some awareness and finding some answers. I didn't know then when my path crossed Angie's that she would be someone so inspirational and helpful on our Grace-Filled Journey. And I'm blessed to call her my friend. If you asked Angie about where she gets her strength and courage, she would probably just shrug it off, saying that she just does what has to be done for Dalton. And she means that. She spent the better part of ten years fighting to find a diagnosis for his condition. It wasn't until whole exome sequencing became available, they were able to diagnose him with Aicardi-Goutieres Syndrome. It is characterized by weak or stiffened muscles (spasticity), and cognitive and developmental delays that range from moderate to severe. Angie checked in with me periodically over Dalton's childhood for various stories about his progress. One of my favorite photos is Dalton with Dr. John Mekala of RehabEdge, where it's hard to tell whose smile is bigger. Dalton just kind of brings that out in everyone. So, I always kind of felt like Angie was a good acquaintance of mine. I loved hearing how Dalton was doing and seeing his smile. But it wasn't until my own journey Angie became such a great resource for me. Although their diagnosis is different, Angie and I have been on much the same journey in taking care of our kids. Some days, that means spending hours (yes, literally hours) on the phone with insurance companies trying to get them to cover this or that because you know how much it would benefit your child. Sometimes, that bubbles over into tears or anger at the process. For me, it's the time it takes to deal with insurance companies - time that takes away from things with Grace. And I definitely begrudge things that take my time from Grace. Other days, it's tears of sadness. While neither of us would trade our Dalton or Grace, some days, it's hard not to grieve for the dreams we had for them. I saw Angie one day, and she told me how hard it had been when Dalton turned 16, and she knew he would never be able to get his driver's license. That same thing happened to me. I was on assignment this summer taking a photo at Vacation Bible School, and I saw so many of the kids in Grace's class singing the songs and dancing. After I got home, I just cried wishing Grace could have been there singing and dancing, wishing I knew what her sweet voice sounds like. It's friends like Angie that help you make it through those tough times, because they've been there too. They know what it's like not to pack a bag of baseball shoes and a bat for T-ball practice or celebrate a special dinner for an outstanding report card. Some days, things like that can be unbearable. But it's also friends like Angie who remind you just how special Dalton and Grace really are. Grace has a smile like Dalton's, and hers is also quite contagious. Her smile reminds me that life is always to be celebrated. It may not come in the ways that we planned, but every day has something worth celebrating. And this month, I'm very grateful to my friend, Angie, for always reminding me that "life doesn't have to be perfect to be wonderful."